. Bunions tend to be hereditary, but can be aggravated by shoes that are too narrow in the forefoot and toe. Diabetes is a lifelong chronic disease that is caused by high levels of sugar in the blood. Overpronation is the most common cause of plantar fasciitis. At Dakota Foot & Ankle, our mission is to provide quality care to informed patients in a comfortable and inviting setting. When you have problems with your feet, you need to turn to a foot and ankle specialist who really listens and responds. Our experienced doctor is well trained and can offer you a personalized treatment program that will satisfy your individual needs. Dr. Gale is a friendly physician who counsels you on the best ways to maintain and improve your foot and ankle health. The best care in the world doesn't mean anything if you can't access it. At Dakota Foot & Ankle, we strive to make our office as efficient and convenient as possible. You can contact by phone, email and even request an appointment. We also provide a patient portal to allow you to access your records. Our friendly staff makes every effort to answer any questions you may have about our office or your treatment. "Even though I waited longer than 30 minutes for my appointment, the wait is worth it when a doctor listens to the patients concerns and then the Dr tells you what you need to do and he shows concern for your well being. Thank you Dr. Gale"
"Dr. Gale and his staff are wonderful. The office feels very "homey" and the staff makes you feel very comfortable. Dr. Gale is top-notch and has helped me with my daily foot pain immensely. I would say a marked, 80% improvement in the amount of pain." "I have never had surgery before but always heard horror stories this surgery with Dr. gale was probably one of the least stressful and most informative visits I have ever had in a hospital. very professional thank you"
"Even though I had to wait longer than usual ( He was very busy with patients). I was very satisfied. He was always very kind and helpful with my husband the many times we saw him before he died 2 years ago." "Very friendly and caring staff! Dr. Gale was very clear and detailed in his communication. I love the fact that his shoe store is right there!" "I find Dr. Gale to be extremely knowledgeable. I have had nothing but positive experiences with Dakota Foot and Ankle. I have recommended the clinic to numerous friends/family suffering from any kind of foot pain." "The staff is incredibly helpful, friendly, and thorough. I was treated like a VIP and feel sad that my feet are getting better since I'll be seeing the staff less often! From the front desk to the exam room, you'll feel right at home and well cared for. Seriously great care and a small town feel in an age of the impersonal, "big medicine" machine. 5 thumbs up for Dakota Foot and Ankle. ;)"
"I searched online for a surgeon to take care of my bunions and hammer toes. I an in my 50s but I am still very active, and my bunions were causing problems when running, cycling, and cross-country skiing. Google reviews and other sources show positive reviews for Dr Gale, so I selected his clinic. Dr. Gale is friendly and he spent a lot of time talking to me and really seemed to understand why I was there and what I expected out of the surgery. I appreciate the time spent talking to me. My surgery went well (both of them) and my recovery is swift. Dr Gale goes the extra distance, and even game me his personal telephone number if I had any problems during the night or on weekends. The followups were equally as personal and professional. Dr Gale remembered my name and the fact that my prime concern is to get back to running and cycling. I can strongly recommend Dr Gale and Dakota Foot and Ankle Clinic." "This is the place to go with foot problems. We tried some things with our family doctor with no luck, Dr. Gale took care of us in short order. He knows how to make feet feel better! He comes across very confident and answers all your questions and then some. I wish more doctors were like him and willing to discuss and explain things so well." "Dr. Brian Gale and his staff are the best. I Cannot stress this enough Had a severe work injury and another Dr. had me walking on it. My foot was getting worse and it was not until we went to see Dr. Gale did my condition start to improve. At the very least I would have had permanent damage or worse as my foot was severely infected. When the state would not cover the cost of an ice machine Dr. Gale provided it at no cost. His staff is the best as well"
"Dr. Gale is the best ever!! Thank you so much for helping me with my feet. You're awesome and I recommend you to everyone, or anyone, looking for a foot doctor. Again, thank you so much!!!" 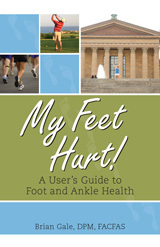 "I have had problems with my feet for many years and it was getting worse as time went on. I got to the point where I felt things were so painful that I thought my career was over. I decided to schedule an appointment with him just to see if there was any help available and his clinic is amazing. To start with the staff did not run me through like "just another patient" even though I was in pain they had the caring attitude to relieve my symptoms. From there Dr. Gale came in and was not condescending from my past history of physical stress and somewhat abuse (paramedic for 36 years) let me fix the problems you have. He explained everything very well and was NOT short with me on asking questions. I wish other physicians were that way! I do not have a lot of experience with DPM's but as far as patient concerns he along with his staff is excellent."